What, you thought a season on the brink would have Jerry Jones worried? Through 15 weeks, teams scoring 35 points or more in a game have lost just four times this season — and the Cowboys have two of them. Dallas is only 4-4 when scoring 28 points or more. Tony Romo has suffered two high-profile meltdowns at home this season, his last minute interceptions costing his team a crucial win. Despite the high-scoring offense, the Cowboys and their league-worst defense could be eliminated from the postseason this weekend. But hey, at least Jerry’s having fun! And having a terrible defense? That’s not a problem; that’s just a strategy. Speaking on his radio show on KRLD 105.3 FM in Dallas, Cowboys owner Jerry Jones on Tuesday morning said that games like this past Sunday against Green Bay make for "an exciting time" and "great entertainment" . . . for who, Packers fans? In case you forgot, Dallas took the field Sunday knowing the Eagles had already lost and that a win at home over Green Bay would put the Cowboys in a tie for first place in the NFC East — and move them one step closer to a playoff spot. And they sure started out like a team hell-bent on the postseason, taking a 26-3 lead at halftime and carrying a 29-10 lead into the final 70 seconds of the third quarter. But a decision to abandon a dominant running game, a porous defense and two costly interceptions due to two poor decisions by Romo on the Cowboys’ final two drives led one of the season’s signature collapses and a 37-36 Packers win before 91,054 at AT&T Stadium. They're fit, they're pretty and we can't get enough of them. Check out the 2013 NFL cheerleaders. 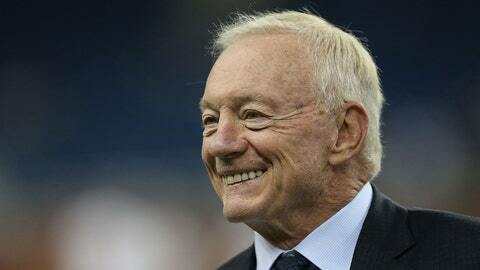 Then asked for his opinion on why the Cowboys blew this one, Jerry’s answer was obvious. Injuries on defense, of course. "We had to quit doing things on defense that we had been doing, that compromised us," Jones said of missing Sean Lee and Bruce Carter, and having Ernie Sims and Justin Durant playing injured and at less than full strength. But then Jones admitted, it may not have mattered who was healthy; that’s how bad his defense is. We weren’t going to count on getting any stops as we went into the ballgame. That’s not being negative. That’s just a strategy. "We weren’t going to count on getting any stops as we went into the ballgame. That’s not being negative. That’s just a strategy." But at least there’s hope . . . he thinks. "If we can get our defense patched up here, we’ve got a chance to really do something this year." That defense has allowed 427 yards per game, more than 20 yards worse than any other team in the league, and in the past two games has surrendered 647 yards and eight touchdowns passing — to career backups Matt Flynn and Josh McCown. As for Romo and the play-calling, Jones again came to his offense’s defense. "With us not being able to stop them, we didn’t want to give them the ball back," Jones said of the reasoning to give running back DeMarco Murray only three carries in the fourth quarter of a game Dallas was leading and in which Murray finished with 134 yards on only 18 carries. "Frankly, when they would score, I wanted to answer them. I was for the aggressiveness that we showed in the [second] half." And for Romo’s late picks? "You could make a case for just execution," Jones said of the first one, an underthrown ball to Miles Austin on a play which was actually run call but that gave Romo the option to pass. "You really had three different kinds of plays and three different circumstances. You get a little more loop on the ball to the interception that occurred when it was going to Miles Austin. You get that thing up in the air, a little more loop on it and Miles is still running. He had pressure. He called off the tight end coming across because he thought theoretically that would bring another linebacker into the position to throw the ball. . . . I understand what happened. The ball got in behind him and the guy made a great play." "I was for the aggressiveness we showed . . . and it can apply to many parts of the game. But in this particular case, aggressiveness was throwing the ball on our end of the field — throwing the ball in there close. Aggressiveness with Romo can mean not throw the ball but buy more time, which increases the chances of having a bad play." "The [defensive backs] made plays in the secondary that we needed to have made. We needed a couple of stops like that from our secondary. But I understand that interception." And the second pick, on an out route on second-and-1 from the Dallas 29 with less than 90 seconds to play and the Cowboys now trailing 37-36? "The last throw at the end of the ball game, you can look back on it. It was probably one that you could take back and should take back, but still, I understand and I think it’s a toss-up as to who’s at fault there. We just got the ball intercepted and made a bad play. [Cole] Beasley’s got a good reason for playing the ball the way he did, under the way we read that play, and Romo has a reason for throwing the ball there." On the play, Romo threw for the sideline while Beasley appeared to cut the route short. The play was originally ruled an incomplete pass but a review confirmed Tramon Williams grabbed the ball before it hit the ground, giving the Packers possession, sending Dez Bryant to the locker room with time on the clock, and ending the game. In Week 5, Romo and the Cowboys suffered similar criticism when, while tied with the then-unbeaten Denver Broncos with under two minutes to play at home, Romo threw an interception on a second-and-16 play from the Cowboys’ 24. Denver and Peyton Manning simply ran down the clock and won it 51-48 when Matt Prater kicked a 28-yard field goal as time expired. It came at the end of what was a career game for Romo, who threw for a team-record 506 yards and five touchdowns. The Cowboys now stand a game behind the Eagles with two to play. Dallas is at Washington this Sunday before closing the season at home against Philadelphia. A Cowboys loss against the Redskins couple with an Eagles win over the Bears on Sunday night would eliminate the Cowboys. Any other combination of outcomes this weekend would mean the Week 17 game would be a winner-take-all matchup for the NFC East crown.